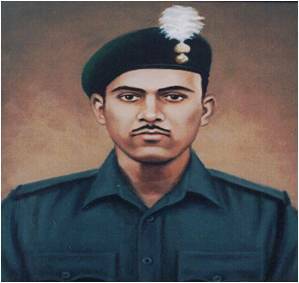 Company Quartermaster Havildar Abdul Hamid was a soldier of Indian Army who is known for his role in the Battle of Asal Uttar during the Indo-Pak War of 1965. He destroyed 6 Pakistani tanks on his own and was martyred while tackling the seventh. He was posthumously awarded the Param Vir Chakra for his bravery. In this article we will have a brief look on his contributions to the country. He was born in the village of Dhamupur in Ghazipur district, Uttar Pradesh on 1 July 1933. There were 4 more brothers and 2 sisters in his family. His father, Mohammad Usman was a tailor by profession. He was martyred on 10 September 1965 (aged 32) while fighting in the Battle of Asal Uttar in Khem Karan, Tarn Taran district, Punjab. Actor Naseeruddin Shah played the role of Abdul Hamid in the first episode of 'Param Vir Chakra', a 1988 TV series on the lives of Param Vir Chakra recipients. A TV Documentary named 'Battle of Asal Uttar - Largest Tank Battle Since World War II' was premiered on Discovery Channel which covered his brave actions in the battle. On 10 September 2017, the 52nd anniversary of Hamid's death, Chief of the Army Staff General Bipin Rawat unveiled a memorial in Ghazipur district in his honour. 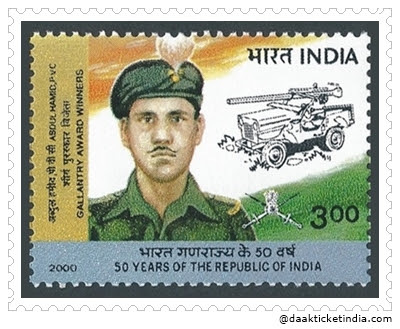 On 28 January 2000, a ₹3 stamp was issued in his honour by India Post.The stamp has a bust of Hamid and an illustration of a jeep with a recoilless rifle. He got enlisted in the Grenadiers regiment of the Indian Army on 27 December 1954. Hamid was later posted to the regiment's 4th Battalion, where he served for the rest of his career. He served with the battalion in Agra, Amritsar, Jammu and Kashmir, Delhi, North East Frontier Agency(NEFA) and Ramgarh. He participated in the battle of Namka Chu during the 1962 Sino-Indian War. He participated in the Battle of Asal Uttar during the 1965 Indo-Pak War for which he was posthumously awarded the Param Vir Chakra. The Battle of Asal Uttar was one of the largest tank battles fought during the Indo-Pakistani War of 1965. Hamid's unit 4 Grenadiers arrived at night on 7 September at the location and Hamid was tasked to lead the vehicle-mounted recoilless rifle (RCL) detachment of his battalion. On 8 September at 7:30 am the first batch of Pakistani tanks arrived, which straddled the road an hour and a half later. The battalion held their fire until a tank 30 feet away was hit by Hamid with his RCL gun and Pakistani soldiers in the other two tanks fled. The Indians experienced artillery shelling at 11:30 am, followed by another armour attack by the tanks. Hamid destroyed another tank and the Pakistani soldiers in the following tanks fled again. By the end of the day, an engineering company laid anti-personnel and anti-tank mines around the Grenadiers' position. The battalion was attacked by Pakistani Sabre jets at 9:00 am on 9 September, with no casualties. On the same day, the Pakistanis made more armoured attacks at 9:30, 11:30 am and 2:30 pm and Hamid destroyed 4 more tanks. The Indians withdrew a squadron of Sherman tanks, which were ineffective against the Pakistani Patton tanks. Centurion tanks were also withdrawn to deploy them in a position more suitable for a tank battle. As a result, the 4 Grenadiers were left with only RCL guns and mines. On 10 September at about 8:00 am the first wave of three tanks, one leading and the other two following arrived. Hamid knocked out another tank with his RCL gun. The Pakistanis attacked again with increased artillery support at 9:00 am and Hamid destroyed another tank. Since his open jeep was vulnerable to the shelling, he moved to another position and ordered his men to take cover. Hamid and a Pakistani tank soon spotted each other. He was alone and could not change his position, so he fired at the tank and at the same time, the tank fired at him and he was killed instantly. The battalion suppressed further attacks by the Pakistanis. India eventually won the battle. The battalion destroyed a total of 13 tanks and many tanks were abandoned by the Pakistanis out of fear. thRadical :Short notes for Competitive exams: Company Quartermaster Havildar Abdul Hamid - The Tank Destroyer !